Slot Games listed are Crazy Jungle Slot from Rival Gaming. Rival Gaming’s Crazy Jungle Slot has a jungle theme with 5 reels and up to 15 different pay lines per spin. The symbols are of course your typical jungle icons including Lion Elephant Snake and typical jungle fruit such as Bananas Coconut and Pineapples. The Parrot is the Wild the Snake the Scatter and the Monkey will trigger the Bonus game. Coin accepted range from $0.01 to $5.00 per line making a maximum total bet of $75.00 over 15 lines. The king of the jungle, the Lion, will pay out a healthy 9000 coins if you spin 5 of them on an active pay line while the next highest is the docile Zebra who will pay up to 1500 coins. 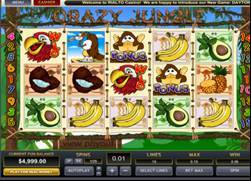 Free spins can be won on Crazy Jungle when the Snake appears simultaneously on reels 1 and 5 and triggering the Monkey on reels 2, 3 or 4 will get you into the bonus game. Three piles of Bananas will appear and choose one of them to get your bonus award.